Ten years ago this month, Within Temptation released The Silent Force: the toughest album they’ve ever made but one that launched them on the road to greatness. Just a few years into the new millennium, the metal world as we knew it underwent a radical change. Nu metal was on its way out; Wes Borland had left Limp Bizkit, Slipknot went on hold to make way for Stone Sour and Murderdolls, and even scene heroes Korn were experiencing a drop in creative and commercial momentum. The end was nigh. Or was it? Out in Europe, some seriously exciting dark metal bands were being created – and a trend started to emerge for female vocalists with hugely powerful but still feminine voices. In 2002, Nightwish’s fourth, breakthrough album, Century Child, sent huge waves across the scene, followed by Lacuna Coil’s Comalies. The following spring, a bunch of Americans called Evanescence appeared from nowhere – well, ok, the Daredevil soundtrack – and rode the crest straight to the top of the charts with their nu-gothic anthem Bring Me To Life. Suddenly, anyone and everyone wanted to know all about those female-fronted bands that had been lurking in the shadows. The timing caught Within Temptation completely by surprise. The symphonic rockers formed from the ashes of early 90s metallers The Circle, who were part of the Netherlands’ new and rather compact dark metal movement, along with The Gathering, Orphanage and After Forever. Although located in different areas of the country, they would bump into each other atshows, swap tales and plan collaborations. Inspired by Gothic-era Paradise Lost and ethereal Aussies Dead Can Dance, guitarist Robert Westerholt got hooked on the idea of combining extreme metal with feminine vocal melodies. He asked his girlfriend, Sharon den Adel, to sing on a track called Frozen and liked the results so much that the pair embarked on a brand-new project. 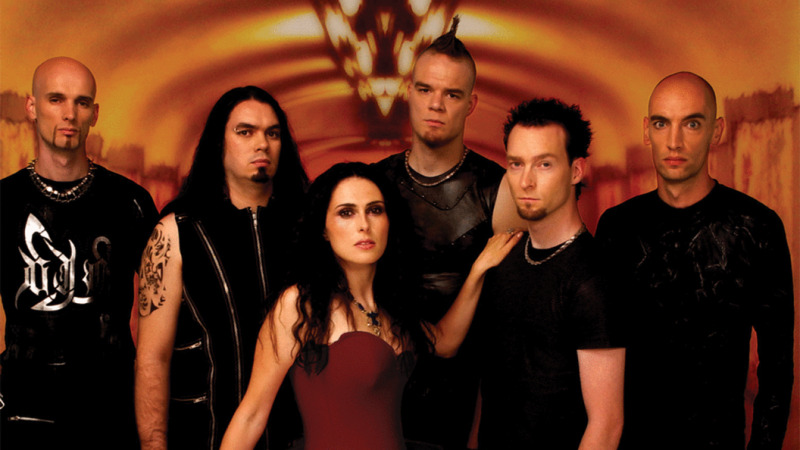 The result was Within Temptation and their 1997 debut, Enter, was an underground hit in the Netherlands. By their fourth-ever gig, they’d bagged a slot at Dynamo Open Air, which at that time was one of the biggest metal festivals on the planet. Their second album, 2000’s Mother Earth, was an even bigger hit that not only won them some local awards but also a legion of fans outside of their home country. Emboldened by this success, the band quit their day jobs and jumped right into the heady world of professional music, hoping the momentum might last another year or two. They were completely unprepared for what happened next. Even so, they made a decision to give it their best shot… but then half the band left, with Martijn Westerholt resigning due to ill health. So, with a new lineup, they set about creating that difficult third album – eventually called The Silent Force – which pushed Within Temptation’s symphonic elements to the forefront, moving away from split-vocal gloomy metal towards something that was bigger, louder and much, much darker than Mother Earth. It would become their biggest release so far, despite being written during one of the toughest periods of the band’s career. Not only did they have to get to know their new bandmates very quickly, but they were under a lot of pressure to deliver the album, like, yesterday. It wasn’t just their working conditions that were difficult. In May 2002, the controversial Dutch politician Pim Fortuyn was assassinated just days before the country’s general election by a man who was concerned about his anti-Muslim views. The news shocked the Netherlands and conspiracy theories were tossed around in the run-up to the murder trial. Within Temptation joined the rest of their nation in trying to make sense of what had happened. Sitting next to the big anthem were tracks like Angels: a spinetingling song that really made the most of Sharon’s delicate but powerful vocals, and the explosive Jillian (I’d Give My Heart), which soon became a live favourite. At the time, many journalists incorrectly lumped Within Temptation into the gothic rock genre, but their sound was more symphonic, retaining their earlier classical, Celtic and progressive influences. But the biggest musical influence of all came from a surprising source… Linkin Park. We beg your pardon, Sharon? Primped and preened to absolute perfection, The Silent Force was released in Europe in November 2004, less than six months after Nightwish’s grandiose Once had finally cracked the UK market. The response was even greater than before, but it would take Sharon and her boys a little longer to grab the British baton as the album’s UK release was delayed. Their first show on British soil took place at London’s Scala that September. It was a sell-out, but the real game-changer was their slot at Bloodstock the following year; when they saw so many new fans singing along to their music, the band realised they had finally made it. Now signed to Roadrunner Records, The Silent Force eventually got its UK release, almost a year after everyone else had got it. It was certainly worth the wait and the following summer Within Temptation were invited to play Download Festival. The money started to trickle in and was used to finance the live shows they’d always dreamed of creating. There were breathtaking sets, amazing lights, awesome pyros and Sharon’s fantastical ballgowns that were fit for a fairytale princess. Finally, Within Temptation had a show that perfectly reflected their gargantuan sound. “It’s as much about the visuals as it is about the music with us,” explains Sharon. “When we go to see bands like Marilyn Manson or Iron Maiden, we want to see a proper show. Because we had epic music, we felt we should have a show to match and we wanted to create a special ambience that fans would talk about afterwards. My outfits were part of that – you can’t go onstage wearing jeans if you’re doing an epic show!” she laughs. Through their powerful music, striking imagery and hard-working ethic, Within Temptation helped pave the way for other European symphonic metal bands including Epica, Leaves’ Eyes and Elysion. Not so long ago, they would have been considered “too strange” for airplay on commercial radio and television but, by the mid-00s, they found themselves in a scene of new bands all with similar influences and ideas. You might naturally assume there was some rivalry backstage and a strong sense of competition between the groups, but you’d be very wrong. Over the years, the Dutch symphonic heavyweights have worked with orchestras, choirs and even hip hop veteran Xzibit, and their inspiring sounds and powerful live performances continue to win them fans all around the world. Interestingly, Robert Westerholt actually prefers to stick to studio work – going as far as leaving the live lineup back in 2011 – but still makes the odd guest appearance onstage every now and again. When you ask Sharon what the secret is to their success, she responds modestly. It didn’t end there, of course. Today, in 2014, Within Temptation are one of metal’s biggest names, already getting down to work on their seventh studio album and confirmed to headline next year’s Bloodstock Festival – which, since their first appearance there, has grown and evolved into one of the most famous and widely respected metal festivals in Europe. the most important bands to ever grace heavy music. And none of it could have happened without The Silent Force. “Its success gave us more confidence to follow our intuition on what direction we should go in,” says Sharon. And, considering what’s happened since, it’s clear they were spot-on. Within Temptation Headline Bloodstock next year. Let Us Burn - Elements And Hydra Live In Concert is out November 17 via Dramatico.